I recently started couponing and I’m already running out of storage. It’s crazy how quickly my stash is growing. What do you do with all that stuff? I’m sure you’ve seen extreme coupon shows and have probably stumbled across a coupon blog or two, but have you observed their storage. Yeah, it’s crazy. I’ve seen walls lined in shelves, things stacked from floors to ceilings and cabinets over flowing with purchases. Wait, I don’t have storage shelves or cabinets large enough for storage! Over the weekend I examined my wood storage. I took inventory of what was lurking in my basement. 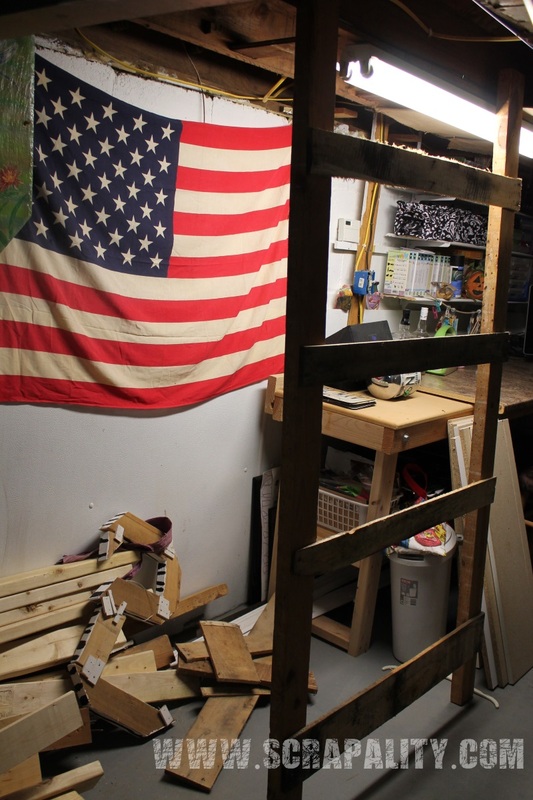 I have everything from pallet wood to 2×4’s left over from the removal of the wall in the kitchen. I can do this! 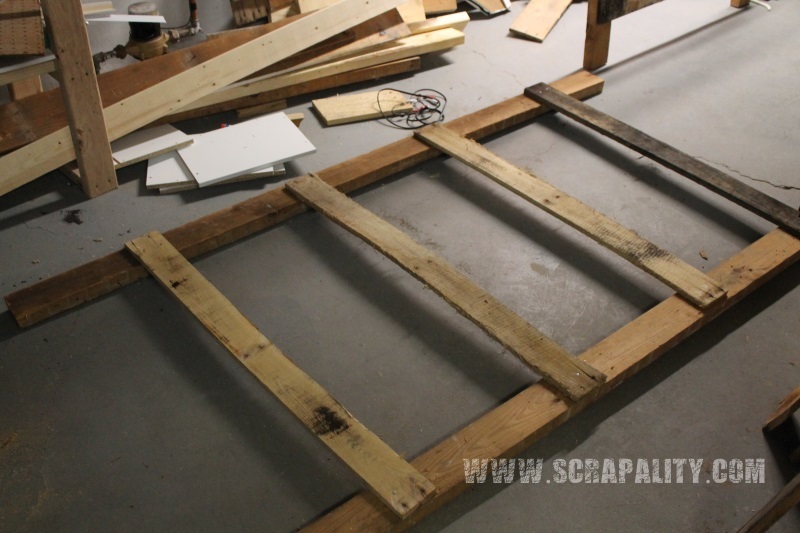 I got to work and started to build a shelving unit using the scraps of wood. Starting at one end of the 2×4 boards. I measured 18 inches to allow room in between shelves. I marked each spot and attached a pallet wood board. I then repeated the same process with two more 2×4 boards. I then added boards to the ends to connect the front and back. For the shelves, I used pieces from a cheap shelving unit that was in ruins and no longer in use. I cut the boards to the perfect size and there you have it. Super easy and free! Now I have a place to store my overflow from my cabinets upstairs. I’m sure in no time these shelves will be filled with all kinds of items. Hmm, maybe I should build more shelves. Do you coupon? 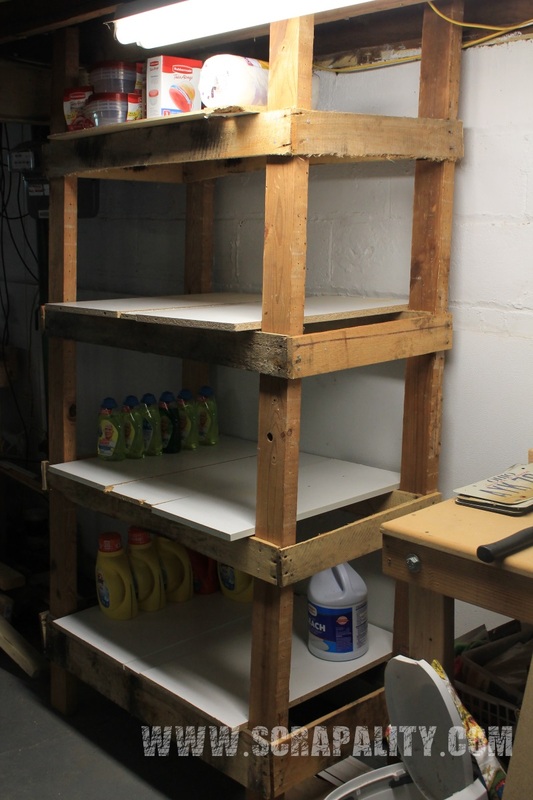 Do you have a massive storage in your basement? If you do, I’d love to see it. This project will be share with some or all of the following Linky Parties. Great looking shelving! You did an awesome job! Great idea for your storage! I used lots of coupons when I had a young family. Still a little, but not nearly as much. Hubby built me a storage room under our front porch. It holds our food storage and seasonal decor. Thanks for sharing with SYC.